with appropriate amendments and extensions as supplied by my wife Sonia. Please note that familiar names are used rather than given names, where appropriate – but in some cases it isn't clear whether a name is given or familiar anyway! I have also made extensive use of the Townend family history compiled by Sir Harry Townend in 1961, and the accompanying family tree which was evidently extended to the mid-1990's by other members of the family following his death in 1976. Please note also that I've (temporarily at least) included dates of birth and death, where available from Sir Harry's history and/or tree, and that I've only included the bare minimum of Kaulback information, which is compiled exhaustively in the Kaulback Connection. I'd also like to acknowledge Helen Thornton's deeply impressive ongoing archive of Townend family correspondence, from which I've corrected a number of embarrassing mistakes on my part in the table below, and continue to enjoy such a fascinating insight into family life during the pre-war colonial era in India. For biographical profiles of the Rev Alfred Townend and his seven sons, taken from The Kaulbacks please click pp 70-71 and 72-73. Bill Townend, who was at school with P G Wodehouse. They remained lifelong friends (see for example the copious references to Bill in Robert McCrum's recent biography Wodehouse: a life, Viking, 2004). Bill himself was perhaps not so talented or successful as PG, who nevertheless always ensured that their relations were on an equal footing. Frank Townend, frequently mentioned in his elder sister Alice's early Random Recollections, and in the article Evidence for an Afterlife (see Alice Townend for both these links) relating to his death from terrible injuries in the First World War, as described in the following section. Click here for additional biographical details. Barney Townend, ICE1, 2 blessed with great intellect and sporting ability, one of the so-called "Heaven Born" of the ICS, as Rural Development Commissioner in Bengal (maybe some contact with Peter Hately Waddell). Possibly of even greater interest today are his wife Joan Bevington's letters in the archive mentioned above. Harry Townend, an eminent trading magnate and chairman of the Shaw Wallace Group, a huge trading and manufacturing conglomerate. His account of its history, A History of Shaw Wallace [etc.] by Sir Harry Townend, Sree Saraswaty Press, Calcutta, 1965, was definitive and well-received: see www.koi-hai.com/Default.aspx?id=502870 (or click here for a local copy). Sons receive a much greater degree of attention throughout The Kaulbacks than do daughters or indeed wives or sisters, and of course this can be understood in terms of the genealogical process itself and indeed the whole tenor of pre-feminist thinking. This is no reflection on Bill Kaulback himself, as we are all imbued with the zeitgeist into which we are born. FROM H.M. WAR OFFICE, 31ST MARCH, 1915. DIED 3.5 A.M 29TH MARCH. 'He was perfectly conscious and calm, and spoke as though he were a medical officer and someone else the victim. He looked at his legs as we moved him on to the stretcher and asked me quietly (he was not in the least excited, and his handsome face showed no pain), to tie something tight round his legs to stop the bleeding. I did what I could with my handkerchief and another I requisitioned, and we took him to our billet. We had to move hurriedly, of course, as a second shell followed, and we wanted cover in case any more arrived. 'There were two R.A.M.C. men with us, and they attended to the subsequent first-aid. They discovered another horrible wound in his arm, and while they were dressing it he told them he thought he would give up football next year. We then took him to the nearest hospital. He was still conscious and perfectly collected, and laughed quietly and talked, apologising for the trouble he was causing, while on the way to hospital. And I came back thinking of that tag in some book or other, I have seen a man. 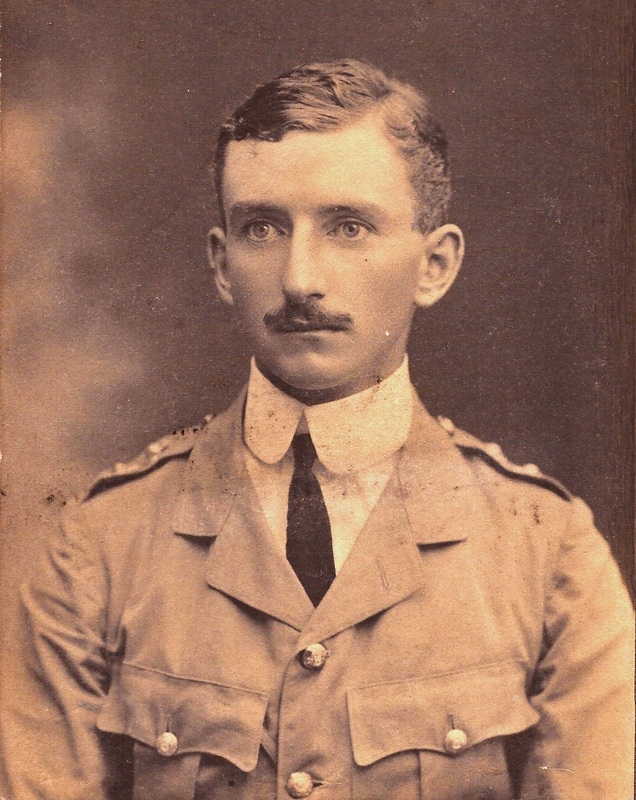 The poor fellow died in hospital'"
The following day the Morning Post said they had learnt that this officer was Captain Francis Whitchurch Townend, Royal Engineers, one of my brothers.